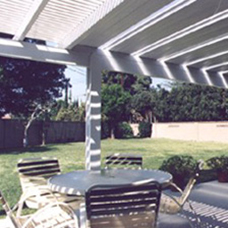 All Pro Remodeling offers a large variety of aluminum patio covers to meet any demand for price, style, or budget. All covers carry the manufacturer's lifetime warranty. 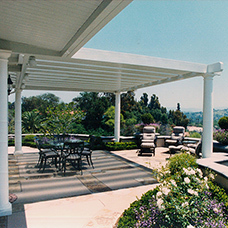 Now you can have a shade structure constructed of aluminum that looks like perfectly cut premium-grade wood that never needs painting or stain. It never warps, splits or cracks. It won't burn or ever become infested with termites. The factory baked "Kynar" coating with multi-step process provides lasting beauty, low maintenance and a maximum gloss retention. It resists abrasion and fading. The deep grained "Driftwood" embossing patterns provide the texture and appearance of actual rough sawn wood and add to the structural strength. 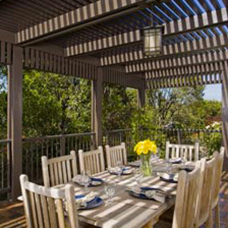 Ultra Lattice is versatile; it can be free standing or attached to your home. 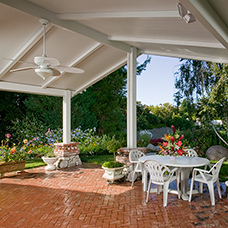 Visit our video gallery to watch a short product video about Ultra Lattice. 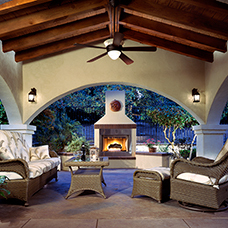 Looking for an Opening Roof System? 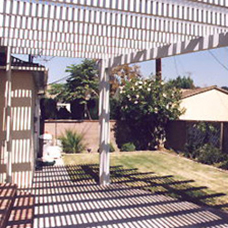 Check out our Pro-Louver Gallery.